Whether you’re riding bikes and basking in the Louisiana sun or you’re playing one of your favorite contact sports, a dental emergency can easily appear when being active. Since it doesn’t happen often, most people don’t know the right steps to take and when they should visit their dentist for treatment. Thankfully, recognizing a dental emergency is simple. Once you do, you should contact your dentist and schedule an appointment, ideally for the same day of the incident. Until you arrive, here’s what you should do. Has your tooth become dislodged or been knocked out completely? Has your tooth cracked below the gumline? Is there extreme sensitivity, even if you aren’t chewing? Is there chronic pain in the back of your mouth? If you answered yes to any of the following, you are experiencing a dental emergency and need to visit your emergency dentist for treatment. Alternatively, if you believe you have a broken jaw or there is significant bleeding, make a visit to the emergency room first. Once you’ve stabilized or received appropriate treatment, your dentist can better aid you. Toothaches are typically associated with large cavities or deep infections. These can be caused by having poor oral health or from trauma, a fracture, or impaction. If the pain is only mild, you can take over-the-counter painkillers until you make it to your dentist. Avoid aspirin though, as this medication can worsen bleeding. Until you arrive, rinse your mouth out with either mouthwash or warm water to wash away food particles or debris prior to your visit. A knocked-out tooth can be reattached, but only if you see your dentist soon after the incident occurred. After an hour has passed, the chances of reimplantation go down significantly, so act quickly. Start by looking for the tooth. Once located, pick it up by the crown only and rinse off any dirt under warm water. Avoid removing any tissue that’s still attached and avoid touching the root. Attempt to place the tooth back into the socket, making sure it’s facing the same way as before. If this is not possible, place the tooth in a container of milk, warm saltwater, or saliva. If the tooth is a restoration, such as a crown, bridge, or denture, do not try to place or fix it yourself. However, if you cannot get to a dentist, a crown can be temporarily placed with over-the-counter dental cement. 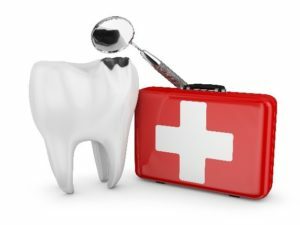 If a dental emergency occurs, know that your emergency dentist is here to help. Schedule an appointment with us today to get treated! Dr. C.J. Landry grew up in a military family and graduated from the LSU School of Dentistry in New Orleans in 1982. Today, he has over 30 years of experience in dentistry and has completed thousands of hours of continuing education in specialty services that are often used to treat dental emergencies. If you believe you are experiencing a dental emergency, don’t hesitate to contact him at (308) 382-4440 or visit his website.